Pacific National railway workers went on unofficial strike on Sunday, reportedly over safety issues. Alison Ribbon reported that the strike was apparently unplanned and dubbed a "wildcat strike" by the railway union. Safety issues surrounding Pacific National have been in the headlines recently, with three derailments involving the company's trains in less than a year. A train carrying paper from Hobart to the Burnie port derailed near Ulverstone a week ago. 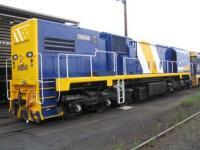 And a 55-year-old man was killed after being pinned by a train carriage during a shunting operation at the Pacific National railyard at Newstead in September last year. Tasmania Police said a Pacific National train driver was left shaken yesterday after almost running down two children fishing from a railway bridge in Burnie. One child leapt into the river, while the other managed to run off the bridge to safety. It couldn't be confirmed last night if any of these incidents had prompted the strike. There were also reports the strike was related to workplace agreements. The Rail, Tram and Bus Union in Tasmania did not organise the strike, in fact, they hadn't been told of it. A surprised branch secretary Samantha Simonetis was reluctant to comment last night on reasons for the strike. "It's a wildcat strike. It's not endorsed or condoned by the RTBU and I'm unsure of the issues," she said. Transport Minister Jim Cox had been informed of the strike last night. The Launceston office of Pacific National wouldn't comment on the strike, instead referring media to the company's public-affairs manager Marie Festa, but she could not be contacted. Six wagons and a locomotive derailed in the most recent incident at Ulverstone. Another five wagons partially derailed. Last February 10 wagons from a 35-wagon southbound Burnie-Hobart train left the rails between Campania and Colebrook. In June last year, three locomotives and three wagons left the track between Perth and Western Junction. Pacific National, Australia's largest private rail operator, bought Tasrail in February 2004. It's not yet known how long the workers will stay off the job.